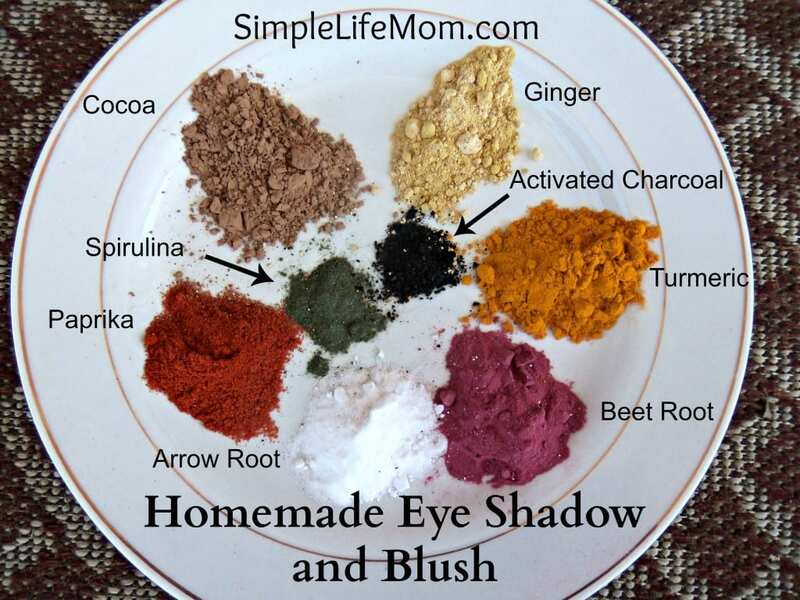 Homemade eye shadow and blush, or any homemade makeup can save you a TON of money. It’s more healthy for you, and it can be fun to make your own. I found the items I needed in my pantry, local vitamin store, or online. Anything that you use on your skin should be tested first; especially anything you use on your face. As you know, the face on your skin can be a lot more sensitive than other parts of your body. Test the ingredients on the inside of your wrist to see if you react, then try a small spot on your face. I grew up in an area where Mica was everywhere! I used to collect varying colors of it….and as a kid, couldn’t figure out why I would break out in an itchy rash….so you never know. This is probably the easiest thing to duplicate in the line of mineral or natural makeup. It’s so easy that I wonder why I never thought of it before! Mix shades that you like and store them in 1 oz containers. Use a small brush instead of your fingers so that you do not spread bacteria, and keep track of your favorite mixes so you can replicate them later. Use cocoa powder. Combine it with arrowroot powder (or organic cornstarch) to make it lighter. Use Green clay or Spirulina combined with arrowroot powder for different shades. Use Activated Charcoal mixed with arrowroot powder. Combine saffron and beetroot juice for a paste. You can also use turmeric, but be aware that it can stain the skin. Many clays make beautiful makeup choices. Try Kaolin White Clay, Moroccon Red Clay, Rose clay, Rhassoul Clay, or Bentonite Clay. Micas are beautiful for added glitter and sparkle. Choose micas that are all natural and do not have extra dyes. That removes most of the benefit of making your own natural and healthy makeup. Use the powders below combined with one another. Add arrowroot powder to lighten colors. Use Cocoa powder, cinnamon, ginger and nutmeg to create beautiful brown and cream tones. Alkanet is my favorite for purple. Mix it with rose clay to soften and lighten the color. Use saffron. You can also combine saffron with beet root powder. Be sure to check out Homemade Lipstick, Mascara, Foundation, and Eyeliner. Wow these all look so great I want to try them. I was just wondering, is it safe to put all of those ingredients near your eyes? It’s safer than all the chemicals that people normally put near (or in) their eyes. Like I said, try the ingredients on your skin first (inside of wrist is sensitive). I have never heard of anyone having problems, except with mica..which surprisingly I can use around my eyes, but not anywhere else on my body. Whilst I make some body products out of my pantry, it had never occurred to me to make my own make-up. Thanks for the tip! Has anyone found a good one for foundation? There are a number of good recipes for foundation. I’ll go ahead and post those. Thanks for the interest. I use Bare Minerals loose foundation. Do you think I could mix something with arrowroot powder to replace that as well? Thanks for all the great ideas! You definitely can. I have a few recipes for foundation that I will go ahead and post. Thank you so much! Could you please reply and let me know when you’ve posted these….I’m really excited to try it! Thank you so much! I know what I’ll be making tomorrow!! Do you know how to make purple for eyeshadow and eyeliner? Good question. A few ideas: dried purple sage crumbles into a fine soft powder, but would give you more of a gray/purple color, rather than purple. Though you could mix that with dried beet to help bring the purple out. Other dried purple flowers would work good as long as your can create a powder with them. Mica is an option, though you need to watch where you get it from and where a mask when mixing. You could also use natural food coloring made from fruit or veggie juice. I’m sure you could find some at natural food stores or online. This would make a paste that you can press into a compact and use a brush to apply. do you think i could use golden seal for eyeshadow or eyeliner? or would that irritate my eyes? i have a lot of golden seal in my medicine cabinet and it never gets gone! Golden seal is an herb with good medicinal properties. Since your skin is an absorbing organ, keep that in mind with what you try. Golden seal is used for many things, including eye infections and is supposed to be good for your skin. Personally, I would use it, but I would try it on the inside of of my wrist to see if there is a reaction, then a cheek, and finally around the eye. Again, I haven’t used it and that’s just my personal opinion, but I think it’s a great idea. This is great, but do you think you could put up more colors for eye shadow? Thanks! Oh, and also, is there another way to make grey and black without activated charcoal? An easy way to get multiple colors is using clays. You just have to watch what other ingredients they have added to the clays for marketing and which ones your skin may be sensitive to. Basically, think of what you have around the house and try these powders, etc. on a small semi sensitive area (your wrist) and see how you react or like it. Where can I find mica and activate charcoal? Craft stores? Natural grocery stores? Lastly, do any of the mixtures go bad or expire? You may be able to find them in a natural foods store that has a vitamin/mineral section. Vitamin stores will often have the activated charcoal. Both can be bought online. I am not an expert so look into this for yourself as well, but since these are not being used for medicinal purposes, I would not worry about any expiration date. Make small quantities of makeup at a time and keep your larger ingredient containers sealed and sterile. Old mixed makeup should be thrown away because bacteria from many uses can grow or build up over time, just as with conventional makeup. This is fabulous – just what I needed, thanks so much!! That’s why I put it up there! I’m glad I could help. How do you make blue eyeshadow? You can use blue mica. What if I am allergic to mica? What other alternative is there? I give lot a of alternatives in my article. Check it out above. Wow, I was just sitting thinking how I could make my own make up and went on your website- thank you so much for sharing! !I would also like to know where to purchase mica and activate charcoal? Craft stores? Natural grocery stores?Do any of the mixtures go bad or expire? I haven’t had anything go bad. The more oils you use, like olive, sweet almond, etc., the more you may have oxidation. That is why I recommend using vitamin e oil or rosemary essential oil when using those oils. You can buy activated charcoal in vitamin stores (in capsule form). This is the finest that you will find. Other sources may have it more course where you will need to use a mortar and pestal before using in a soap or makeup recipe (but it’s cheaper). How do you get the colors to stick to your eyelids? I’ve tried using some of the ingredients mentioned and they just rub right off and don’t have much pigment. Which ones were you having difficulties with? I love to use the cocoa, or a combination of cocoa and cinnamon and it goes on beautifully. I think, just as well as the store bought colors I would buy. Make sure your face is clean and dry. I’ve tried making my own eye shadows and it always rubs off. Any suggestions? hhhmm, two ideas. Make sure you’re oil free before putting the eye shadow on (so make sure your oils are fully absorbed first). Add a neutral powder before the color to absorb any excess oil. You can slightly wet your eye shadow as well to help set it. Let it dry well before doing anything else with your eyes. Hope that helps. Is there a way to make these into pressed eyeshadows safely? I don’t like the idea of using rubbing alcohol and that seems to be the only way. I would like to know your opinion on it though. You can use an oil like sweet almond or apricot oil. Just add a drop or two at a time until it’s just damp enough to press. Thank you for all your tips. I will try to make my own makeup now. Love it! That’s great Annie. Let me know if you have any questions. Hi Kelly.I”m from Vietnam and i have a question ,can i use kaolin for white eye shadow and how can i make rose eye shadow? Yes, you can use kaolin clay. For rose, I would use the kaolin clay again, and mix in some hibiscus or beet root powder until you get the color you desire. Have fun! Thank you Kelly,and what can i use for yellow eye shadow ?and how long can i keep its for all reciepes? I would love to make a pure white eye shadow. Is this possible? Try white kaolin clay. Some clays are very white and they are all natural. How do you get the blush to stay on. I mixed arrowroot powder with beet root powder and it all ended up in my hairline!!! The same for the eyeshadow I made with spirulina and arrowroot powder. Any hints would be appreciated. Debbie, I make sure my skin is moisturized really well and I apply with my fingers instead of a brush (using a brush if necessary for extra blending).It stays in place. Hey! I found recipes for home made make up on other sites on the internet and here I saw a strange thing: Nothing is mentioned about shea butter or other oily ingredients to mix the powders with… do you just put these powders on your eyelids and that’s all? Or have I missed something? You haven’t missed anything. We try to keep things simple. These are ingredients you can use to make color combinations of you choice in loose powder form. Apply with a brush or clean finger. They combine with the moisture already on your skin and stay wonderfully. This is so interesting….is this how people long ago made their beauty products, do you think? I have a couple questions, Kelly. What do you use for mascara? If you do have a mascara, how do you clean it off the eye area without getting the cleansing agent in the eyes? I’ve noticed some of your other recipes for facial cleansers, and wonder about getting these products close to or in the eyes. Thanks! I like to use oils to remove makeup, but good ol soap and water works really well. Just don’t get in the eye like you wouldn’t when normally washing. You can use one of the colors above that you prefer and add a very fine mica to it to add shimmer.